Honda has revealed images of the all-new HR-V, a small crossover to rival cars like the Nissan Juke, ahead of its Paris Motor Show debut in October. Sales start in Summer 2015. 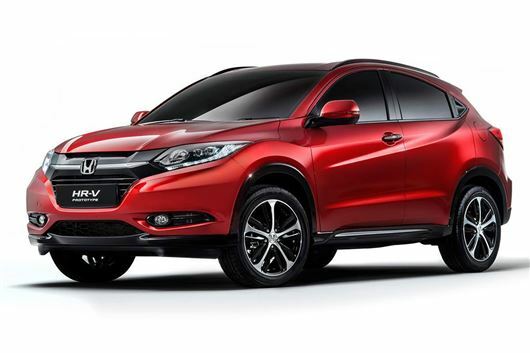 The HR-V is already available in Japan, where it is called the Vezel. It is based on the same platform at the upcoming new Honda Jazz and is powered by a 1.5-litre petrol engine with 131PS, or as a hybrid with the same engine, plus a 30PS electric motor. The Japanese market car is offered with front- or all-wheel drive and a CVT automatic transmission, which you can expect to see in the UK – although final UK specific specifications are to be announced. Like the Jazz, the HR-V gets ‘Magic Seats’, which can be configured in a number of ways to maximise space – the seat bases in the rear row can be folded up for loading tall objects, plus there is storage under the rear row and it can be folded completely flat for maximum load volume. Hmm, hybrid with a total of 161PS sounds interesting especially if it is a plug-in, I hope it goes into the Jazz and Civic. Current engines are distinctly lack-lustre since the demise of the 2.2 diesel and 2.0 petrol engines in Honda's small cars. Yet in Japan and the US they get some cracking motors. Otherwise we will have to wait for the turbo VTEC YO to spread from the Type R. They can keep their flipping CVT, though. Sure glad that Honda has produced the HR-V without a spoiler mounted midstream in the back window. This should satisfy a lot of us who are use to driving without having to look through a split back window and not able to see the full view.